To lead towards a better society, through social work education, research and practice. Educating and developing professionals who have the capacity to engage in and influence our changing world through social work practice, policy and research. Advancing research, practice, and policy that shapes the future of a profession that crosses national boundaries. Providing leadership by mobilizing knowledge that incorporates the range of expertise existing within the broader social work communities that exist internationally. Collaborating with our diverse partners to address social inequities at local, national and global levels. Promoting professional, competent and ethical social work practice. Knowledge can be integrated and applied to practice. Competence in performing practice skills can be developed. Field education is an experiential form of teaching and learning that takes place in a service setting. Learning is achieved through the provision and/or development of services to clients, communities, organizations, or the society. Social service, health, and educational organizations voluntarily demonstrate their commitment to social work education through offering practicums. Experienced social workers provide field education to students. Students learn to practice within the professional framework of social work values and ethics, developing a commitment to the profession of social work. Social work practice competency behaviours provide the framework for the practicum. This model defines those behaviours believed to be necessary for competent social work practice. It serves as a broad framework for field settings in developing their practicum program. Using this model, materials have been developed to assist students and field instructors to describe learning opportunities, define how social work competencies will be addressed, and evaluate the student’s performance. This manual contains information for use by, and has been developed from the experiences and feedback of, students, field instructors, and faculty-field liaisons (FFLs) in carrying out their respective roles in the field practicum. It is expected that students will be actively engaged in their own learning in the practicum and will take responsibility, with their field instructors, for designing a practicum that will meet FIFSW’s competency expectations. FIFSW is committed to ongoing feedback and redesign of the practicum course so that the goal of providing a high standard of excellence in teaching and learning may be achieved. 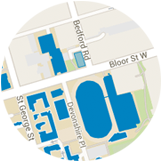 Registers with U of T Accessibility Services if accommodations are required; Communicates with the Practicum Office, where applicable, when accommodations may be required in practicum. Provides feedback through surveys/questionnaires to the Practicum Office (voluntary). Attends FIFSW Professional Development Workshop Series (recommended). Selects and makes available educational resources upon request. Reviews student learning contracts, mid-term and final student evaluations. Meets with students to discuss private concerns. As with other courses at FIFSW, the practicum is typically a Toronto-based course. Settings represent a wide range of opportunities: health care organizations, educational institutions, social service agencies, associations and advocacy groups, and government ministries, to name a few. Agreements between U of T and the organizations are formalized through signed Affiliation Agreements. From time to time, practicums may be arranged outside of Toronto on a case-by-case basis. screens expressions of interest and assesses whether these practicums meet the FIFSW standards before confirming. Students are NOT to initiate independent requests of any social worker or organization. Students select practicums from the available offers on the Practicum Administration System (PAS). In-person practicum interviews precede the practicum commencement. Many organizations/field instructors will only consider an in-person interview. As such, students are required to be available for practicum interviews. For students who reside a significant distance from Toronto, the Practicum Office will try to facilitate alternate interview formats, i.e., Skype. However, this is at the discretion of the organization and field instructor(s). YEAR I: Interviews typically occur in November and December. YEAR II/Advanced Standing: Interviews typically occur May and June, but may extend into the summer. NOTE: Before selecting practicums from the PAS, it is recommended that you familiarize yourself with the entry-to-practice requirements/application for registration set out by the social work regulator in the jurisdiction where you intend to practice social work. The criteria set out by the social work regulator may have a direct impact on your practicum selections. Students should assume that their practicum will require a current police reference/vulnerable sector check prior to commencing. Costs may be associated with the application process. The written results are to be provided to the practicum as requested. A delay in obtaining results or failure to pass the check may jeopardize entry to the practicum. For residents of Toronto: The Toronto Police Services’ Police Reference Check Program offers the service. Application forms are available in the Practicum Office. Students must bring photo identification. The application and fee by certified cheque or money order must be MAILED to the Toronto Police Services. For residents outside of Toronto: Each jurisdiction will inform students of its application process. If needed, the Practicum Office will provide students with written confirmation of their enrollment in the MSW program. All students placed in a Public Hospital (Public Hospitals List) are expected to have their immunizations up-to-date in order to comply with the Public Hospitals Act (1990). Students are required to have an Immunization Health Record Form completed in its entirety by a healthcare provider (e.g. Physician, Nurse Practitioner, Occupational Health Nurse). Failure to comply may jeopardize your practicum. Effective December 1, 2014, The University of Toronto requires all students completing a practicum in Toronto Academic Health Sciences Network-TAHSN-hospitals to follow “Vaccinate-or-Mask” protocols during the annual flu season. This means that all students who are placed in TAHSN hospitals are required to either be vaccinated against influenza or wear a procedure mask during influenza season in areas where patients are present and patient care is delivered. If your practicum is being completed within a non-TAHSN healthcare facility, we encourage you to inquire about the organization’s influenza policy during your interview and follow their established practices. Some settings require a mask fitting. Arrangements can be made through the mask-fitting clinic located at St. Michael’s Hospital. (Mask Fitting – N95 Questionnaire). Some settings expect employees and students to work flexible hours, including evenings and weekends. Student safety is of paramount concern. The FIFSW, MSW students, and our partners in field education have collaborative roles and responsibilities to ensure safety in the practicum. Complete the Checklist I Practicum Safety and Learning at the start of the practicum/rotation and Checklist II Practicum Learning and Reflection at the practicum mid-point. Home and community sessions are cited in the literature as providing invaluable information about clients and their environments. Inherent in home and community visits, there are a number of challenges which protocol and safety practices in the field can address. The Ministry of Training, Colleges and Universities provides students with coverage through either WSIB or Chubb private insurance while registered in the practicumcourse. Coverage does not include classroom instruction or orientation that is held outside of the scheduled practicum. The University of Toronto protocol regarding closures due to inclement weather can be found at https://www.provost.utoronto.ca/planning-policy/cancellation-of-classes-university-closure-adverse-weather/ . Practicums may be in locations experiencing different weather conditions with different agency responses. Students are advised to consult with their field instructor should they wish to heed weather alerts provided by the University or by other sources. FIFSW is committed to providing accommodation to support students with documented disabilities to facilitate academic and co-curricular success. The Practicum Office will make reasonable efforts to ensure that appropriate supports are in place. Students requesting accommodation must be registered with Accessibility Services. Information on how to register with Accessibility Services is available online: https://www.studentlife.utoronto.ca/as/register-accommodation. Students requesting accommodation for practicum should discuss this with their assigned Accessibility Advisor as soon as possible prior to the practicum matching process. An Advisor can confirm practicum accommodations by providing a letter directly to the Practicum Office. Student Professional Conduct Agreement in Practicum Breaches of the ethical and behavioral standards are serious and represent failure to meet standards in a professional setting. Standards set by the Ontario College of Social Workers and Social Service Workers (OCSWSSW). Privacy protection is a legal, professional, and ethical responsibility. When in practicum, you are required to comply with applicable professional standards (see CASW, OCSWSSW and University of Toronto links below) as well as legal requirements and policies of your practicum setting for privacy, and security standards for personal and other confidential information. University of Toronto requires encryption of all personal and confidential electronic information that is kept outside of secure U of T servers. Please review the “Policies and Guidelines” section of the Manual Encrypting Personal and Confidential Information and refer to the University of Toronto FIPPA Guidelines Regarding Security for Personal and Other Confidential Information. The University of Toronto respects student’s privacy. Personal information that you provide to the University is collected pursuant to section 2(14) of the University of Toronto Act, 1971. It may be used and disclosed as necessary for official university purposes and shared within the university on a need-to-know basis. Information about you will also be shared as necessary for your classroom or field education in the program, to support your success in the program, and to provide letters of reference in the future. The field practicum is an integral part of the program. Information about you will be shared with agency representatives, field instructors, field liaisons and educational coordinators as necessary to support and evaluate your progress. The University will protect your information in accordance with the Freedom of Information and Protection of Privacy Act.